The exiled leader of the Indigenous People of Biafra (IPOB), Nnamdi Kanu has confirmed that he is in Israel. The IPOB leader made this known during an online broadcast which he made on Sunday, October 21, 2018. This is coming after photos of him praying at the Wailing Wall in Jerusalem surfaced on social media on Friday, October 19, 2018. During his broadcast, he called on everyone listening to observe a minute of silence for the 28 people who he said gave their lives to save him from the military. 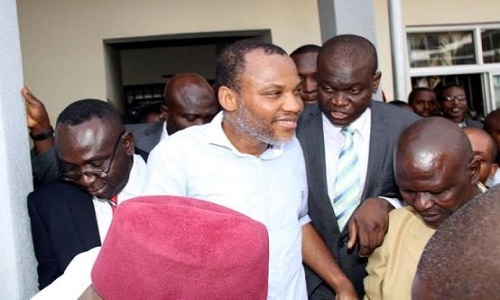 Kanu said that the plan of the Nigerian government was to assassinate him under the guise of a military exercise. You will recall that soldiers attached to Operation Python Dance 2 allegedly launched an attack on his father’s compound on September 14, 2017. In his broadcast, the IPOB leader hailed the former Governor of Ekiti state, Ayo Fayose for his support, and said that IPOB stands with him in his time of persecution. Kanu also thanked Senator Enyinnaya Abaribe, Prof. Ben Nwabueze, Archbishop Anthony Obinna and many others for standing for the truth. The IPOB leader expressed gratitude to the US President, Donald Trump and Israel’s Prime Minister, Benjamin Netanyahu for standing with the Biafra group.